Chances are if you’re reading this, you are the keeper of your family’s history. Given my love of photo books, it’s probably unsurprising that I too am the guardian of our family’s stories. It’s not a title I have been formally given, and it’s a title I would have to share with my brother. From a very young age, we both were interested in knowing more about where we came from, what our grandparents were like when they were younger, why they emigrated from the homeland and how our parents were the first of their families to end up in America. For some reason we felt it was important to not only know and understand these things, but also to preserve them. Here’s the steps and my best tips for making your own genealogy photo book. If you’re lucky, perhaps someone in your family has started a genealogical record of your family. If not, there’s no time like the present to gather information on your family. Talking to family members to get as much information as possible is key. Sites like ancestry.com can be a great resource if you’re just getting started. Old family photos are a treasure. Ask your parents, grandparents and other relatives if you can borrow their photo albums. There are services out there that will scan your photos for you, or you can scan them yourself. Once they’re in digital form, you’re good to go. Way back when I started looking into my family history, there weren’t any online resources, just good old paper and pen. I recorded it in one of those family tree books I bought from the bookstore at the mall. Nowadays you can buy software to help you keep track of all the names and dates and better yet, there’s free software out there. I read about the best free genealogy software here and found another genealogy site that looks to be helpful on the topic. There are many ways that I can think of to put a heritage photo book together, but first I would suggest thinking about the theme of the book. You don’t have to have a formal family tree record if that’s not the type of project you’re looking to create. Don’t let gaps in your tree keep you from making a heritage photo book. Photos and a general narrative is all you really need. It does help however to focus on how you plan to organize your book. Is there a certain topic or family member you plan to center your book around? For example, for a Mother’s Day present a couple years ago, I made a photo book for my mom. The whole book was focused on her – photos from when she was a young girl, her school photos throughout the years, college days and my parents’ wedding etc. Sure there were a lot of family photos, but the main focus remained her, so that helped me tailor my photo selection. Once I had picked the photos, I let the photos lead the narrative so that made it pretty easy to put together. So, if you’re finding it daunting to plan a whole family heritage book with all your relatives, focus in on one family member or couple, such as your maternal grandparents for example, to make your project a lot more manageable. Then later make a second separate book about your paternal grandparents. What’s great is once you have a format for the first book, just reuse the templates for the second and you’ll have a cohesive series of books. The latter books will go much faster. A family photo book can also take the form of a memorial to a loved one. My brother gathered numerous family photos and made a photo book about our grandmother after her passing at the age of 98. He put together a wonderful book to celebrate her life and we made copies for all the relatives to remember her by. Another way to organize your heritage book is with a theme. 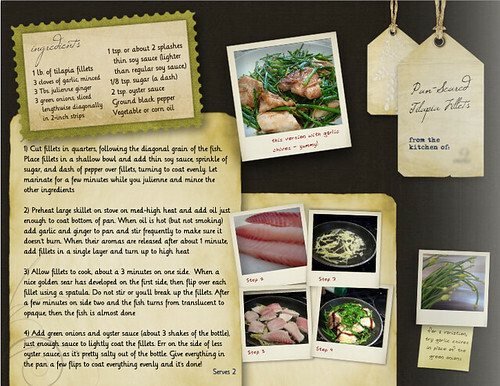 A “secret family recipe” cookbook is a great way to focus your photo book around a concept. Gather all those amazing family recipes from grandma and make sure to add those fun anecdotes surrounding the history of the dish – where the recipe came from, what occasions it is typically served, what makes it special. Snap some photos of the dish and of grandma and you’ve got an awesome gift for everyone in the family for the holidays. I love making a photo book that you can easily duplicate and make presents for all your relatives. How’s that for checking everyone off your holiday shopping list? Or you can even make it a collaborative project and get everyone in on the fun. I’ve actually done a project like this with a group of friends which included all of our photos from the past year. It was fun to share recipes and get those Facebook photos off our computers and into our hands. We even had a party and did a yearbook signing like back in our high school days! Other ways to organize your book would be to focus it around a big family event, like a wedding, anniversary or family reunion. Now that your prep is done, pick one of the many awesome photo book companies out there, upload your photos and create your layouts. For more tips on how to make your own photo book, be sure to check out my series of how-to posts which get into more detail about the process. 1) Though most of the photos may be old family snapshots, wouldn’t it be fun to recreate an old photo where everyone is posed in the same spot as a picture taken decades earlier? 2) At one of our last gatherings with our grandmother, it would have been very hard to get all of us in a single photo, so we broke it down into generations. My grandma with her children and their spouses, then grandma with her grandchildren, than grandma with her great grandchildren, down by each generation. She lived to be a great, great grandmother. Amazing woman! 3) Don’t try to do all these steps at once. I think folks are deterred from a project like this because they try to do it all at once. That’s why I’ve tried to break it down into steps and I encourage making a series of photo books rather than one giant book. Think of it like a multi-volume set. I think that would look amazing on your bookshelf don’t you? Good luck with your photo book projects! A family history was the very first Photo Book I ever made. It was 6 years ago and I made it with Blurb. I had already scanned in all my grandmother’s old photos years earlier, so it was just a matter of putting them in a book. I chose to divide the book up by my mother’s mom and dad and then my dad’s mom and dad. Since my mother was 36 when I was born and my grandmother was 36 when my mom was born, just 3 generations back and I was already in the 1830-1850s. Luckily, I had some photos dating back to the 1860’s. Really cool stuff. To make it simple, I chose just a black linen background and no frames on the photos. I used a white font and kept it clean and classic. 95% of all the photos were black and white and looked nice in this format. I am so glad I took the time to make this book and I have shared it with relatives. Besides, it is so much nicer than a box of photos on the top shelf of the linen closet. I bet your book will be something your family will cherish. I like the cover you posted on Facebook! I am working on a Family History book right now. I figure it will take me a few years to complete. Right now I am gathering family history stories, photos, documents. Thankfully it’s a matter of contacting the right family members. Make sure to check out http://www.familysearch.org. I am including my side as well as my husbands side. It will most likely end up being a two book series at 100 page books each. Yikes! Glad I’ve given myself a far out due date! I think it’s fun to keep an ongoing project going, even if it goes for a while. Thanks for the tip on the site. Will check it out. Good luck with your book! Great post! I love family history. Another good family history site for finding your genealogy is familysearch.org. It’s got a huge database, and it’s free.